It’s too easy to get caught up in a “beach” theme when filling the lakehouse. Beach, this is not. Although we do have sand and water…but, it’s not a beach – far too rustic, rural and earthy for that. 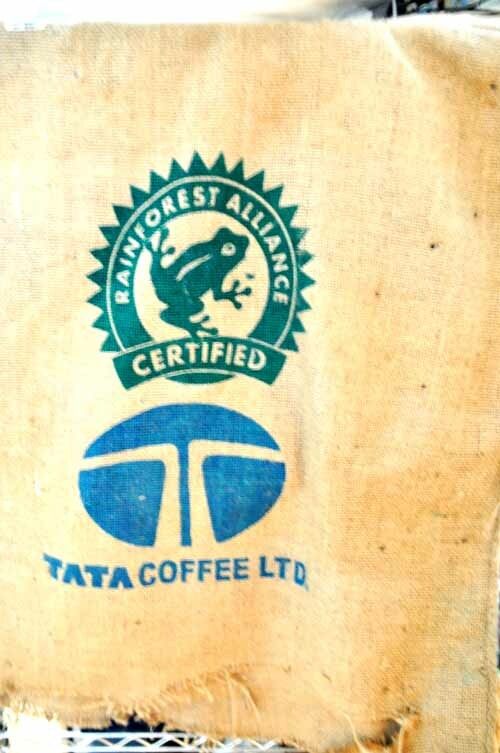 So, when I spotted a jute coffee sack here at the local Rural King, with a nice green frog emblazoned on the front, I realized I had struck “Rainforest” gold. If any image symbolizes the lakehouse, it is nothing but the frog. If any habitat describes our experience here, it is more like a cross between Amazon Rain Forest and a farm. At least, that’s the way the adventures run at our house. 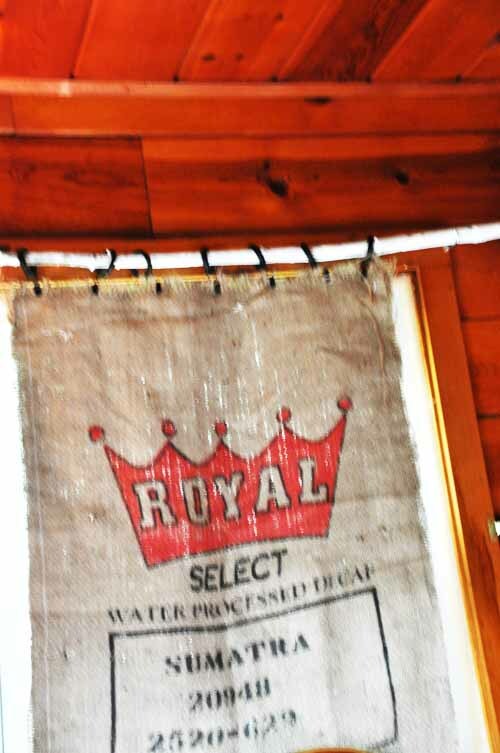 Then, I found this second burlap coffee bag with the word Royal emblazoned on the front, and I turned the pair of them into curtains for one of the bedrooms. 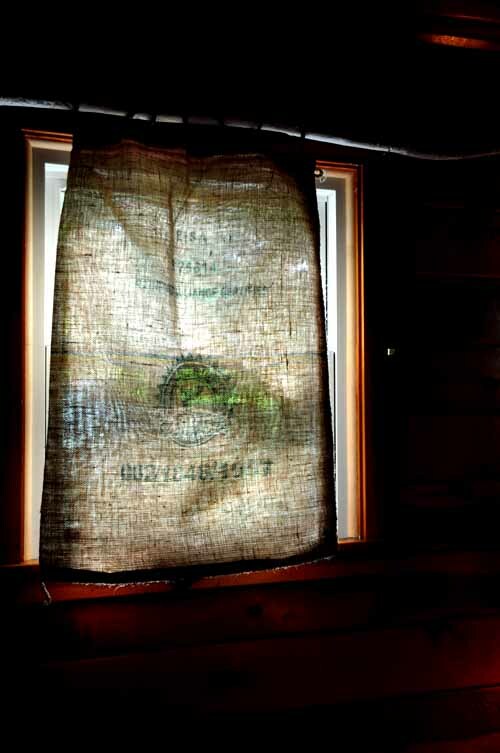 The sacks are doing their job so well, that I couldn’t get enough light in the room to take a good picture – so I had to move the Mr. Frog sack outside to show you the beautiful artwork. The effect is subtle, but you just know the frog is there… just the way it truly is here. 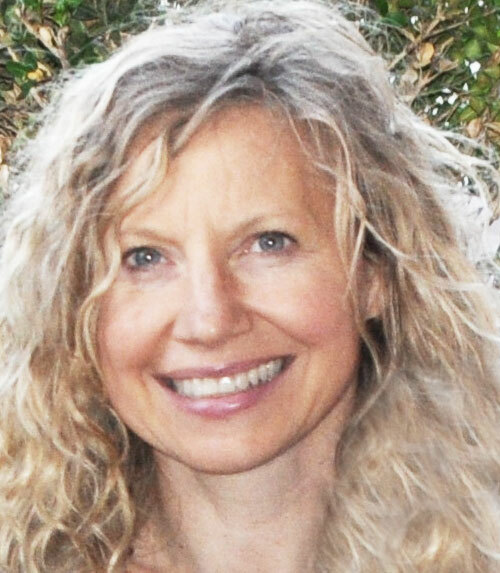 Glad to see that you are enjoying the lakehouse. Wish we had one because it is way too hot in the city already. 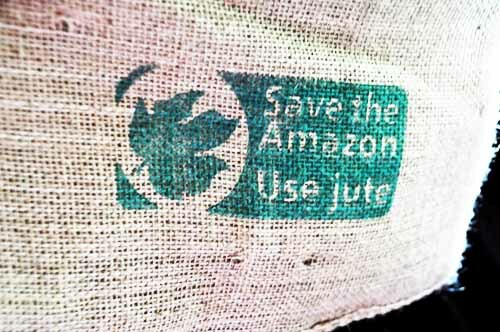 They do thier job well those coffee bags. As a site note, here in Denmark I’ve never seen such bags. It’s all plastic and foil ..
Amazing. I would never have thought of this!